Bartow, the “City of Oaks and Azaleas,” is a wonderful place to live in Polk County. 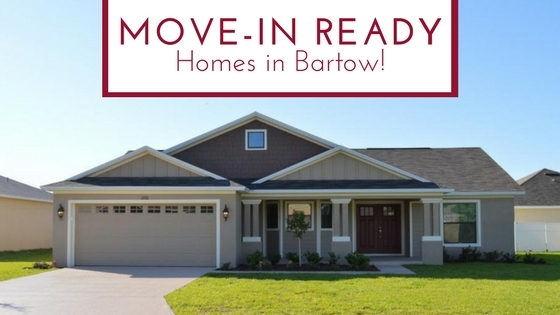 If you are looking for a new home in Bartow, we have a couple of move-in ready options at one of our Bartow communities. James Town Place is a beautiful, quiet community near Polk State College and Bartow Hospital. James Town Place’s central location gives residents easy access to all the shopping and dining Bartow has to offer along with easy access to HWS Y98 and 60. The Roanoke is priced from $197,756 and features 3 bedrooms, 2 baths and 1,600 square feet of living space. The Roanoke has a welcoming and open entrance foyer which leads to the spacious great room with vaulted ceilings. The kitchen includes a nook and seated bar and offers an option for a bay window and a free-standing island. There’s also an expansive formal dining room, great for hosting private dinners. View the Roanoke floorplan and features list online. The next available home is the Savannah. Priced from $198,350 with 4 bedrooms, 2 baths and 1,783 square feet. This charming home features an open floor plan with a kitchen that caters to family living as well as entertaining with its large seated bar that overlooks the great room and dining room. This home provides a den/study, ample storage space and a private master bedroom and bathroom with the option to add a separate tub and shower. View the Savannah floorplan and features list online. Prices and terms are subject to change without notice. Please contact us to speak to a sales representative to learn more by phone at 888-899-7434 or email at service@mysouthernhome.com.